"This is just... ridiculous," I finally managed to say, looking around in a daze. Laughter. "Didn't you know this is the biggest bike-show ever?" No, I did not! And I thought I was well-informed about the D2R2 before finally taking part this year. It is a "dirt road randonee" with lots of climbing. It offers glorious views of rural Massachusetts and Vermont. And cyclists travel from all over the Northeast to ride it. But knowing this did not prepare me for the bike festival that unfolded before my eyes. 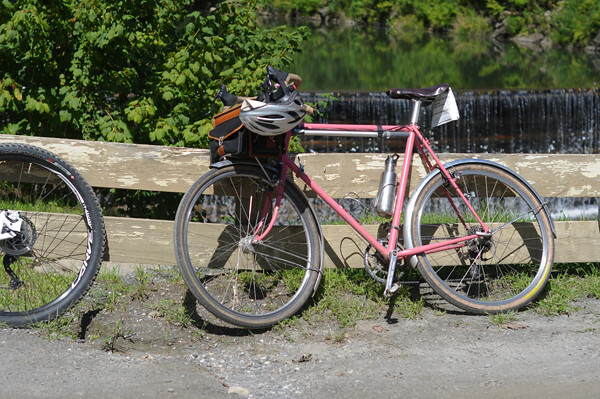 I had brought my camera for the scenery, but before the ride even began I was running around photographing bicycles. So what bike does one bring to a 70-180 km ride that is infamously hilly and takes place mostly off-road? Wide tires, responsive handling and low gears were the general consensus. 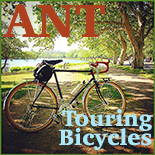 Getting more specific, most of the bikes present fit into several distinct categories. 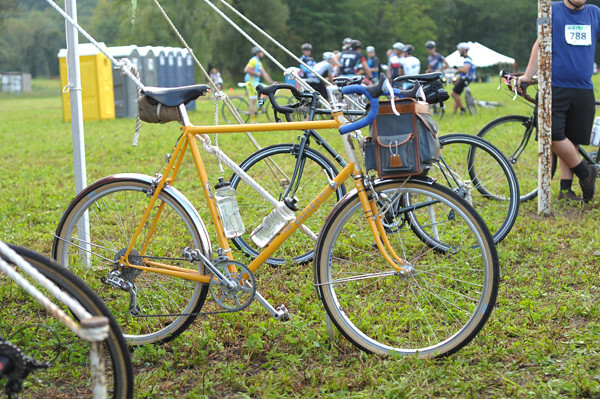 To my amazement, classic steel bikes with wide tires, front racks and French-style handlebar bags were extremely popular. Not that I am not pleased to see that; I am just genuinely surprised that so many of them even exist on the East Coast. 650B wheels were rampant, as were the 42mm Grand Bois Hetre tires. There were quite a few low trail bicycles, both custom and production, including those by Boulder, Rawland, Weigle and Matchak Cycles. There were also many vintage refurbishments and 650B conversions - some frames with aftermarket braze-ons, canti bosses and paint jobs, and others unaltered. Current produciton road-to-trail bikes with standard front-end geometry were also well represented - both with 650B and 700C wheels - in particular the early Rivendell models. And of course there were Bridgestones. While mass produced bikes in this category were present as well, it seemed to me that the custom, small-batch production, and vintage bikes outnumbered them. Many local custom builders were represented, including Circle A, ANT, Sketchy, Igleheart and Wojcik. 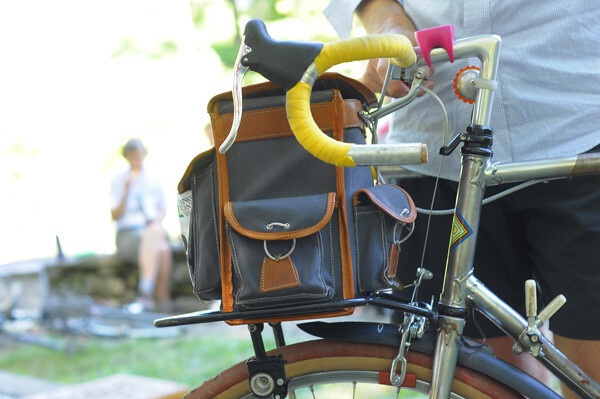 Whether modern or classic in style, handlebar bags seemed to be more popular than saddle bags, regardless of a bike's front-end geometry. I am guessing this is because a handlebar bag makes it easier to retrieve items without stopping, while providing a built-in cue-sheet holder. 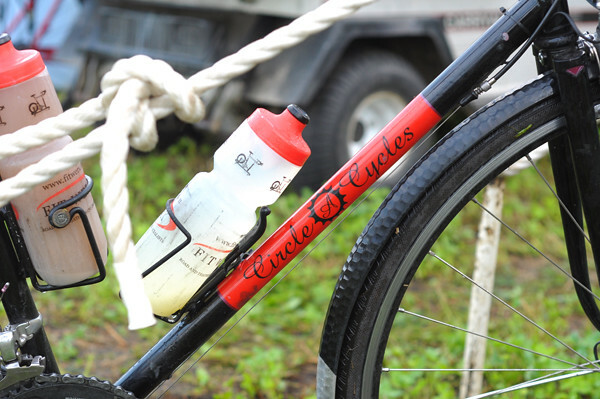 In equal measure to the fat tire classics group, the other huge category were cyclocross bikes. Their performance-oriented geometry, relatively light weight and clearance for wide tires make them good candidates for riding dirt roads. Most of the manufacturers represented were local builders: Geekhouse, Independent Fabrications, Seven, Firefly, Tomii, Spooky. I have never seen so much titanium at one event before, although steel and carbon fiber were also popular. Some West Coast names made an appearance as well, including Rock Lobster and Vanilla. 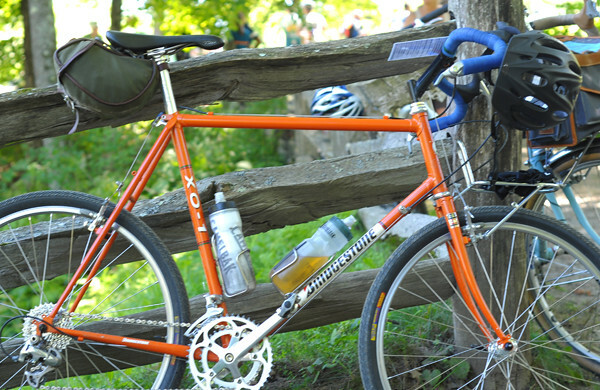 The cross bikes were generally outfitted fairly minimally, with only a small bag on the handlebars or behind the saddle. There were some groups and teams present who treated the event semi-competitively and tried to make their bikes as unencumbered with extra weight as possible. Some even went so far in this regard, as to leave the frames unpainted! 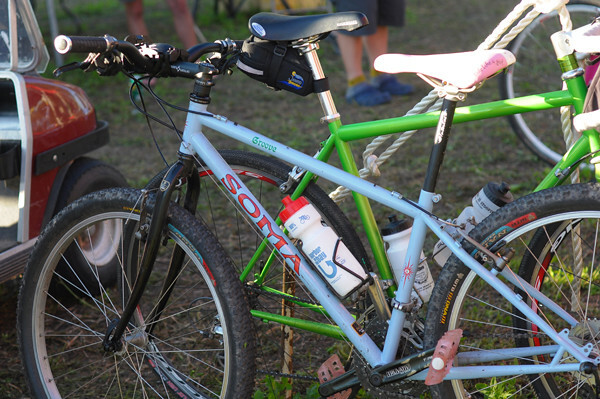 While not as popular as the road-to-trail roadbikes and cross bikes, mountain bikes were a distinct presence. Not the fastest on climbs, and the limited handle bar positions could get tough on the longer routes, but the mountain bikes were great on descents. 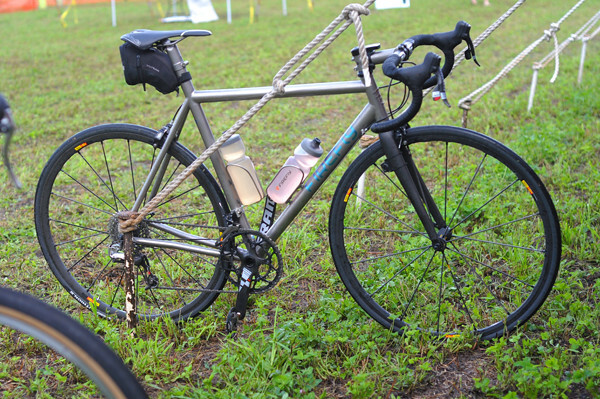 Terrain was not an issue with their enormous knobby tires. In the opposite camp were those cyclists who feel quite comfortable riding dirt and gravel on standard roadbikes, fitted with the widest tires the frames and fork clearances would allow - usually 28mm. Some believe there is some speed advantage for those who can manage this. But the drawback is that narrower tires tend to get more flats off road, potentially canceling out any lead time. Of those cyclists I spoke to who'd gotten flats (sometimes multiples) during the ride, most were riding tires 32mm or narrower. Finally, there was a handful of upright town-and-country types of bikes, including comfort bikes, step-throughs and mixtes. All had wide tires and low gearing and overall their riders looked comfy and happy. While I saw a few walking up hills at several points, this could have been avoided with lower gearing. With the right features, it is quite possible to ride an upright bike comfortably on this type of ride, as long as there is no expectation of keeping up with those on more aggressive machines. 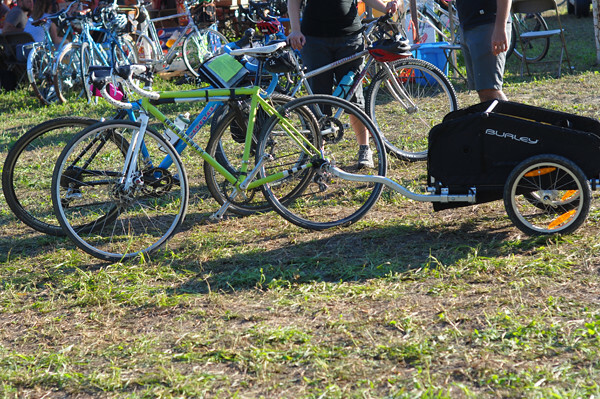 There were a few cyclists hauling trailers with children and pets, which was fun to see, not to mention impressive. Wish I could have captured them in motion. But I was surprised tandems were not popular. I spotted only two: a Seven and a Burley. 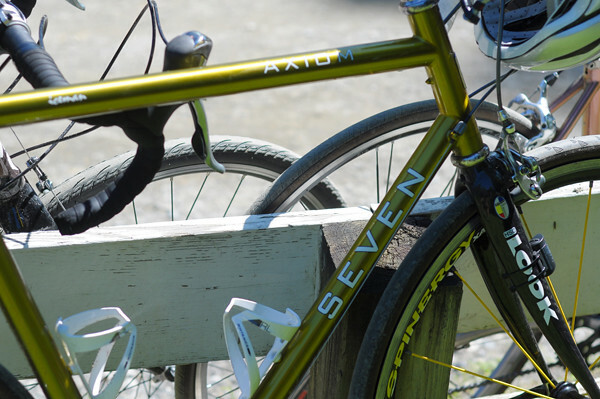 There are many choices for bikes out there for those interested in hilly off-road rides. While the D2R2 seemed to be dominated by custom, vintage, refurbished and otherwise unusual bikes, there are plenty of production models that can meet the requirements as well. Based on my own experience with this ride, I would say aim for wide tires, low gears, and handling that is as responsive as possible without exceeding your comfort zone. The D2R2 was possibly my favourite ride ever and I will write about it soon. Meanwhile, the full set of bike pictures can be found here. Not sure you'd want a responsive-handling bike, but you'd want something fairly efficient here. For sure any new-school carbon would be out of place, given what I know about how rugged the terrain can be. Natch for the metal bikes. An old school Look 555 would work too. I really don't understand some of the clashing East Coast color schemes. I get this event but I don't as well; people make such a huge deal out of it. Looking forward to the ride report. 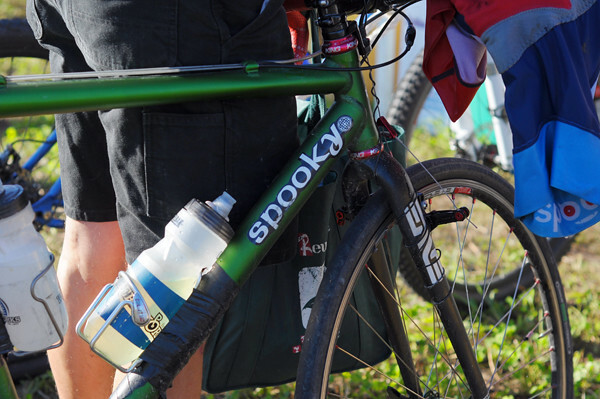 The variety of bikes at D2R2 is a validation that there are many perfect bikes for a dirt randonnee. 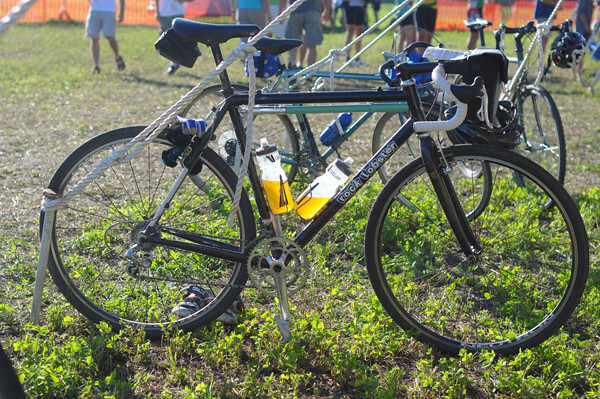 FWIW, D2R2 is a great event not only for the ride, but also for the attitude, the enthusiasm, the food, and the snazzy bikes. Yeah, I think part of the big deal-yness of it all is how friendly everyone is, and how much the FLT people and their volunteers are committed to putting on a really fun event. Seeing the sign by the Green River covered bridge thanking cyclists for donations last year was a nice touch... the locals are very accomodating, sharing their little piece of the backcountry with all of us. What a fantastic bunch of great bikes all in one spot. Much more fun than a bike show! Wow, I hope the ride was as fun as the photos were drool worthy. 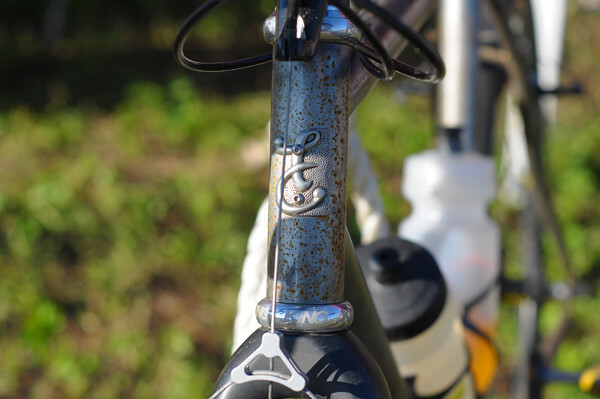 I love the variety of bikes, but especially the classic lugged 650b low trail bikes. I have yet to build up my aspired bike. Frames, honjo fenders, shifters, bells, cranks etc sit around my house like artifacts. sounds like an amazing ride! I'm a long-time lurker on your blog, and first-time D2R2 participant (115k) this weekend. I figured the person snapping all those photos might have been you! 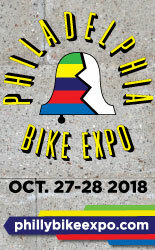 I should've said hello & tried to get my vintage Cannondale into the slide show : ) I too thought the event was fabulous-- one of the best bike rides I've ever done, for sure. 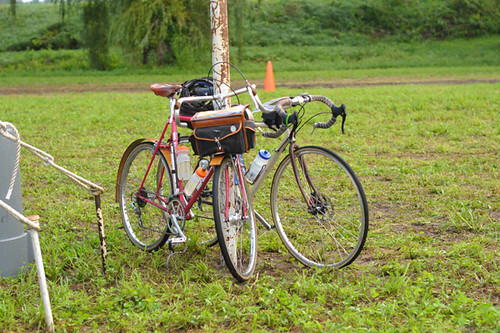 And as you so beautifully document, the array of bikes present was a delightful part of the whole experience. Thanks for the lovely post-- see you next year! I only dipped my toes in this time, doing a slightly longer version of the Green River Tour. But will be back for the 100K next year. Unreal! How many cyclists were at this ride? Must have been close to 1,000 participants. I saw numbers in the 900's. I know your primary interest was in photographing interesting/custom bikes, but what percentage of the 900-1000 bikes were of that ilk? 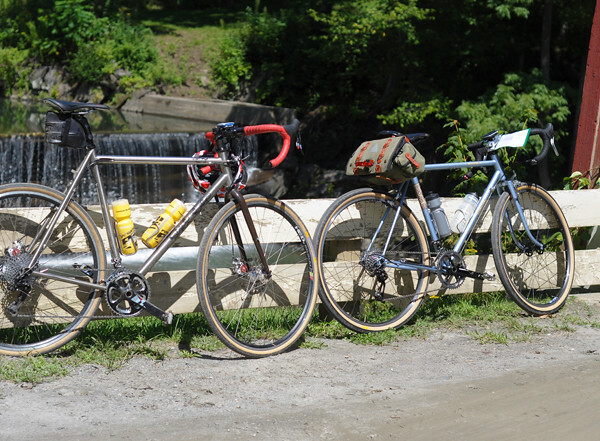 Conversely, what percentage, roughly were "off the rack" carbon or aluminum major manufacturer bikes? It's really hard to say without an official poll, especially because the unusual bikes are inherently more noticeable. Maybe someone less biased than I can give their opinion? But as for off the rack, it was mostly rugged bikes and not so much lightweight alu/carbon. Quite a few mountain bikes. Cant give you hard numbers, but I can confirm that there were a lot of C&V and custom bikes. Of course Velouria might be right that these bikes are more noticeable than the garden variety. Oh, surely someone can take a wild guess! Was it half, less than half, more than half? 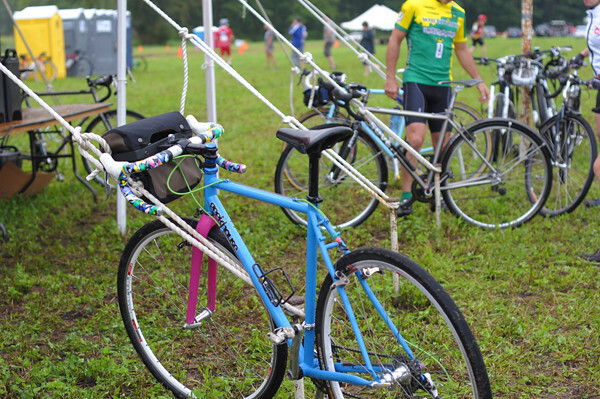 If you include the custom cross bikes and others that are not necessarily classic but either handbuilt or somehow unusual, I would say more than half. For the most part where I ride, my preferred 28 through 32 tires are the giants. Imagine riding where people think I'm a weight weenie. I have really come to appreciate New England attitudes toward development. Despite significantly lower population density, one has to travel very far in the Midwest before encountering unpaved roads. It is really a treat how quickly one can get from crowded urban areas to real country in N.E. On your way spend 20 on a DeLorme Wisconsin Atlas. The transitions from paved to unpaved road are noted so precisely it's spooky. The contour lines are more accurate than USGS Survey. I've a friend who's a senior cartographer at Rand McNally, he says DeLorme is pieces of the True Cross. He's right. The key to riding Wisconsin is simple. Highways have numbers and you leave them alone. County roads have one or two letters. One-letter roads have traffic in SE Wisconsin but mostly they're good enough. Two-letter roads are bicycle roads. Roads that have names on the map are town roads. Those are heaven. Most but not all unpaved are town roads. Until you get far north the unpaved are mostly surprisingly well surfaced. With family members in Lake Geneva and Ft. Atkinson, I am in Wisconsin a fair site. 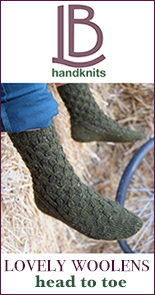 Have DeLormes for Wi and Ma. Sure, travel far enough into the land of cheese and one can wind up in fairly rural country - albeit for the most part privately held and off limit. My point about NE and Ma in particularly is how much effort the people there have put into keeping places open. To put in perspective, the D2R2 took place about the same distance from Boston as Elkhorn is from Chicago. Despite the fact that Ma has almost 1 million more people than Wi, riding in Franklin County is more akin to riding in LaCrosse than riding in Walwoth. Fortunately Gov. Scott did not kill existing Amtrak. Taking the bike on the train to the land of sky blue water is still a doable, but not really for a weekend given how long it takes to get there and back. You have high standards Matt. When the traffic I'm dodging is badger and snapping turtle I figure I'm rural. Years back I got to visit a few times at the old 7-11 training camp in Delafield. D'field of course not so built up then. All the team riders always swore that Wisconsin riding was the best riding in the world. And these were guys from everywhere who'd been everywhere. My family is in Stoughton. We should maybe ride some time. This was my first D2R2 and one of my favorite rides as well (100k). Stunning scenery, heads-up terrain, nice people, tasty food, and a cornucopia of bicycles. I will be back. As a lovelybicycle reader it was fun to meet you, and others of bicycle-internet-fame, in person. 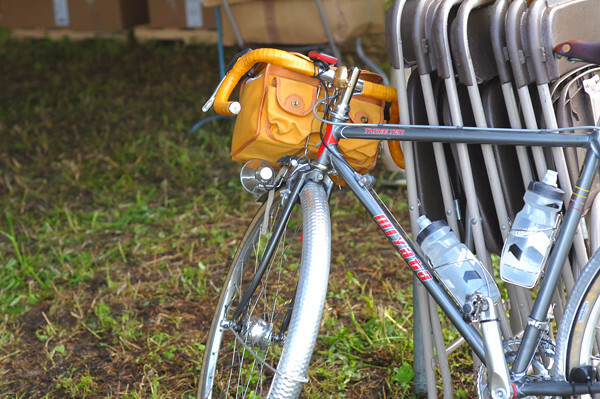 I was running the stripped Raleigh International with Hetre 65bx42 (photo above). It was great bombing down the hills at full speed. My heart went out to the skinny-tired brethren lining the gravel descents to change flats. 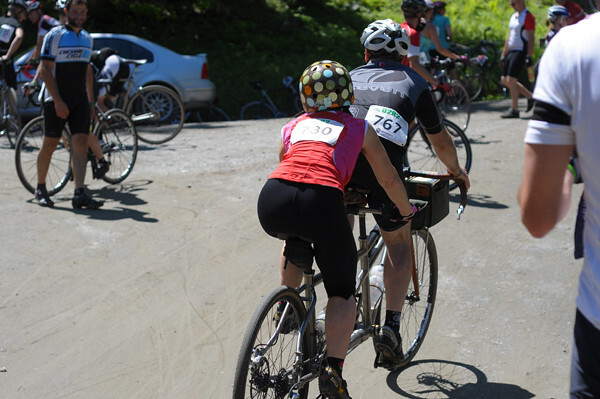 There were people riding everything from carbon fiber road racing bikes to fat bikes. The only thing I didn't see was recumbents or unicycles. Ha! I'm sore that I didn't take more of those peaches with me. I just had one there and didn't want to overdo it. I probably could have had three! Somervillain, It was great to meet you in person as well. I can't believe I didn't eat one of those peaches. I was afraid that if I stopped for too long my legs would never start going again, so I just filled my bottle, applied sunscreen and hopped back on. .s.s. - I was stalking your bike for some time at the lunch stop and was ecstatic when you finally appeared. It was good to meet you! I did not deserve peaches, since I didn't do the climb to the orchard... but another cyclist was kind enough to share anyway. Thanks, B! My whole training plan for round two with the 100k next summer will be aimed at improving my peach-carrying capacity over Hawk Hill. Yes, I think several fellow riders lost things on Hawk Hill. Very glad to see the local crowd appreciates Massachusetts peaches. A darn near perfect fruit experience. Somehow glazed over V's report some of the riders were on MTBs! 100k on fat knobby tires is real endurance. Oh yes. There was a ladies MTB team doing the 180k route. Don't see why that would be such a hardship. Sure, not fast but certainly sure-footed. Not a hardship necessarily, but certainly pushing knobby tires takes more strength than pushing smooth. Somervillian - yes, those fat knobbies gave license for fast, gnarly descents. I just knew by the absence of blog posts this weekend, that you were there. That and the fact that all I was thinking about this weekend was D2R2. This was supposed to be my first go at D2R2 as well, but a recurring knee injury has plagued me all summer, so, no go. Looks like it was another great event and I am looking forward to your write-up. Have been on some of these roads before and they are great riding. Next year! I hope you get your knees back in order to do one of the rides in the future. I did the 2009 100k on a Surly Cross Check with 30/27 gearing and 700x32 commuter tires. An easier gearing would make the hills easier on the knees. 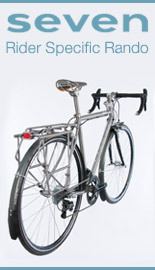 Veloria - my bike wouldn't have made your photo shoot but it did the trick. It now has 30/32 gearing and the hills will be easier next year. 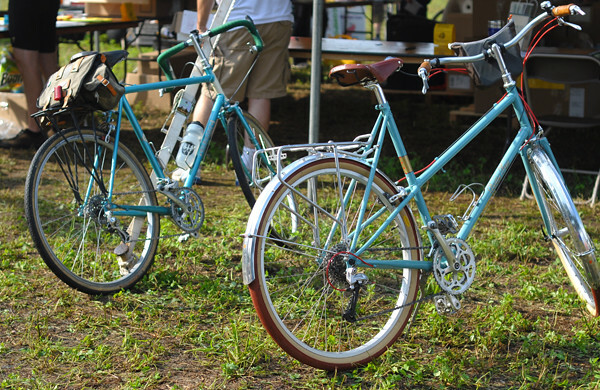 The 2009 ride was also a bike show in disguise. One of your photo shoots makes it look like you saw lots of mud. Really enjoyed your photo set. Sounds like a wonderful weekend of riding and companionship. 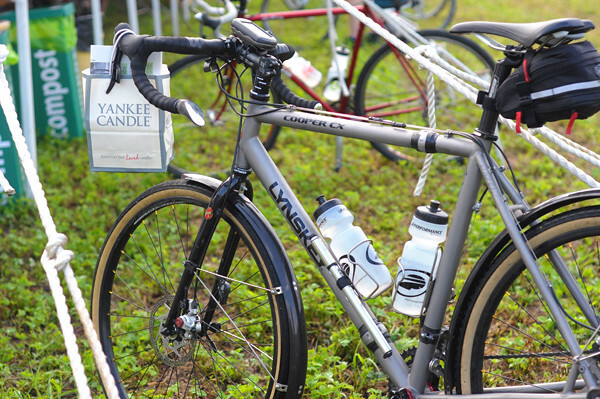 I guess it's not surprising the event is filled with such high end/interesting bikes--in one critical mass--assuming most there are like you, which is to say a serious hobbyist/cyclists. Just curious. Which bike did you ride, Velouria? I was on a Rawland Nordavinden test bike, which I later bought. Here's the initial review, and here's my build. Oh man this looks like fun!! First D2R2 for me and it was an absolute blast doing the 100K. From beginning to end, every mile was wonderful. I was riding an IF 'cross bike I bought used last fall and it was perfect, especially after I re-geared it to have 1:1. Most people just made a social event out of it, riding hard, yet playing hard, too. Great vibe. The bike show was definitely part of the spectacle, and thanks for the pics. 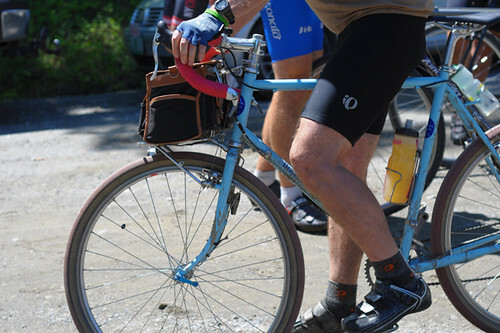 On the downhills, I got smoked many times by the same guy on an old touring bike with downtube shifters. The kid absolutely flew. Signature moment: riding on a ridge with great views, middle of nowhere, there's a short granite post marking the boundary going into VT. Should have taken a pic. Dan, was it this one? Franklin Hill Rd, I think.